It hasn’t been very long since our family enjoyed cruising on Carnival Liberty and yet I find myself yearning to go back. 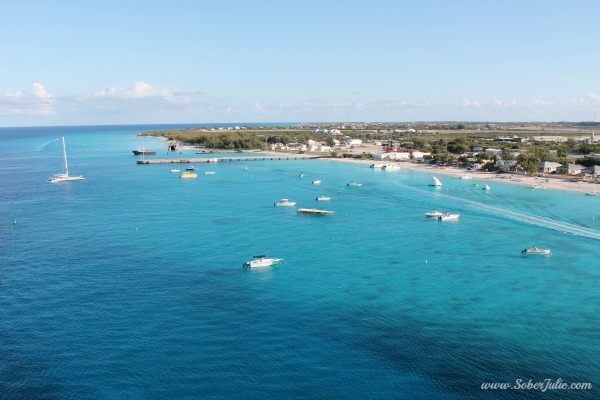 In March we cruised for 7 days from Port Canaveral with stops in Grand Turk; San Juan, Puerto Rico and St. Thomas. We had a spectacular time at the Journey concert, which was held right on board the Liberty as part of the Carnival Live tour and stayed in a balcony cabin which was a first for our family. You can see our thoughts about the balcony cabin on the Liberty here and you really should check out the blog post where I shared Carnival Cruise Line’s famous Chocolate Melting Cake Recipe…YUM! 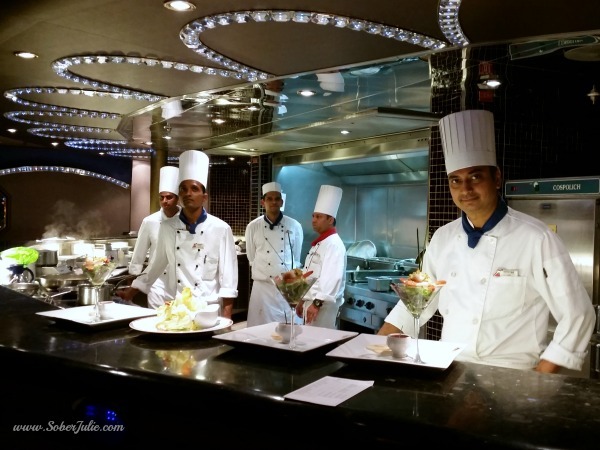 I have shared a bit about our cruise, and today I thought we should share some of our Top 10 things to do aboard the Carnival Liberty. 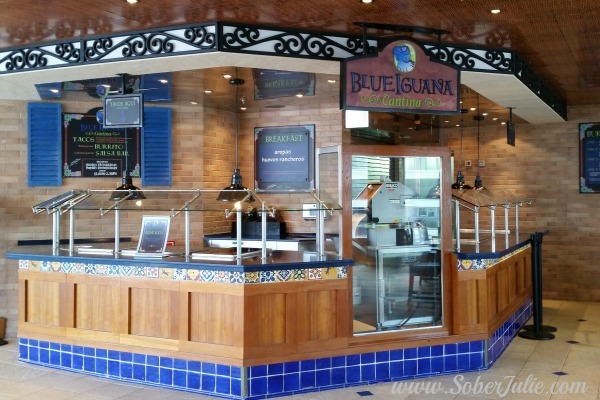 This was our first stop as soon as we boarded the Carnival Liberty. 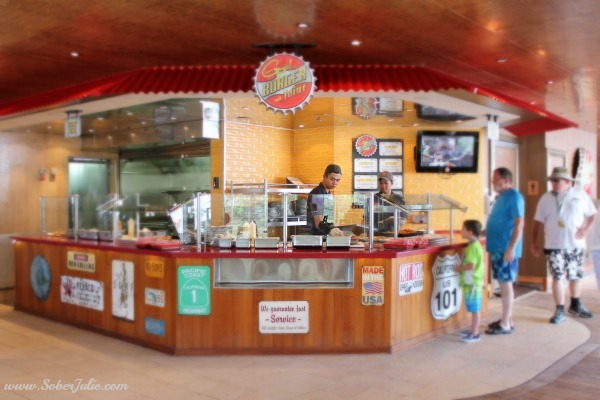 We had time between boarding and when our cabin would be ready so we headed down to the Lido deck to enjoy the fantastic burgers only Guy can provide. As a foodie, I was excited when I heard that Carnival teamed up with best-selling author, restaurateur and Food Network personality Guy Fieri to bring a road side burger feel poolside on the ships. 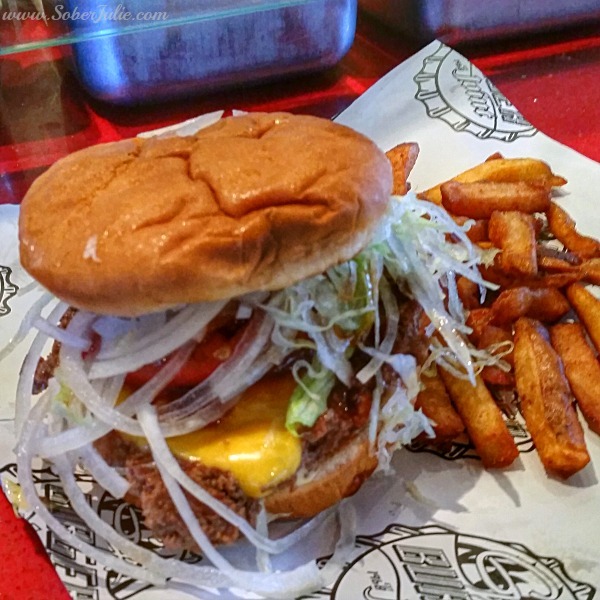 You can see Guy’s Burger Joint menu HERE and trust me, you’ll want to try them all! My personal favourite is the Pig Patty…this baby was totally worth the calories! 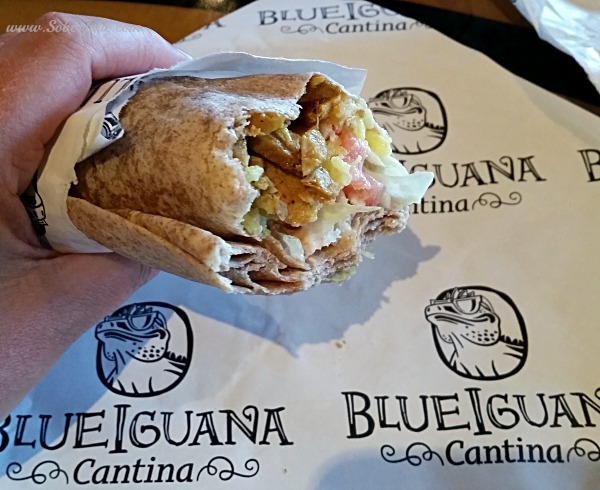 The Blue Iguana quickly became our favourite stop for fresh, healthy choices aboard the Liberty. We do love our Mexican food and with fresh Tacos and build-your-own Burritos, how can you go wrong? There is also a Salsa Bar which kept my heat-loving husband happy! You can see the menu online HERE. Camp Carnival is by FAR our girls favourite thing to do on a Carnival cruise. When we took our 1st cruise we had NO idea how much they would enjoy it…to the point of not even saying “goodbye” anymore, simply running in to find their friends. There are 3 different age groups; 2 to 5 years, 6 to 8 years, and 9 to 11 years. Each group has counsellors who are educated and knowledgeable in providing a FUN, structured experience for the kids. Camp Carnival begins most days at 10am and is FREE…yes I typed FREE! The kids can even stay for meal times with their counsellors and friends and if it’s an in-port day you even have the option of leaving the kids on-board if you’d like. There is a program called “Night Owls” where you can have the kids stay from 10pm-1am for an added fee, this is something special for them where they usually get a take away gift. With the kids in Camp Carnival, what will you do with your time? 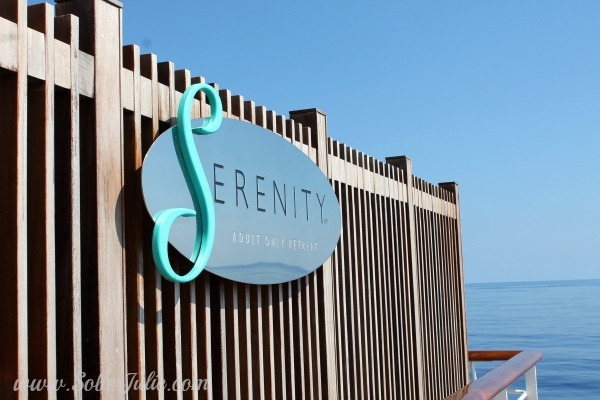 Say hello to Serenity Adult Only Retreat. This is located on deck 12, the Sun deck and is a lovely retreat where there are no kids around. With beautiful loungers, a hot tub and a bar it is a quiet location where you find relaxation at its best. One of the girls FAV things to do was spend time on the water slide. 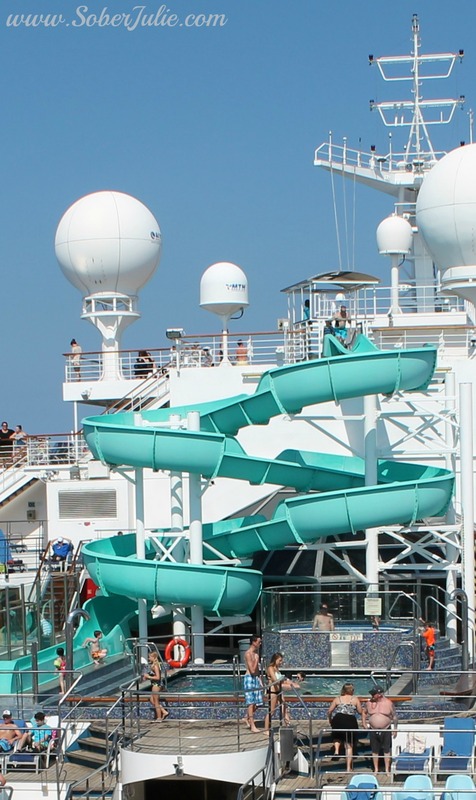 It’s located on Deck 10 the Panorama deck and was where the girls took off to whenever Camp Carnival was out. The nice part about this is that we could sit in loungers right beside the water slide to keep an eye on them while basking in the sun. They could be heard screaming and giggling their way down the slide and then more laughing as they paddled in the pool. 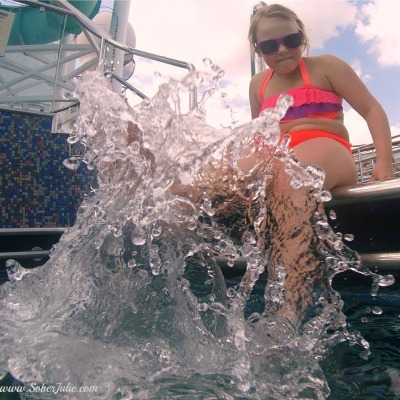 We allowed them to take the GoPro into the slide and pool, this is 1 very cool shot that Sydney(11) managed to get. 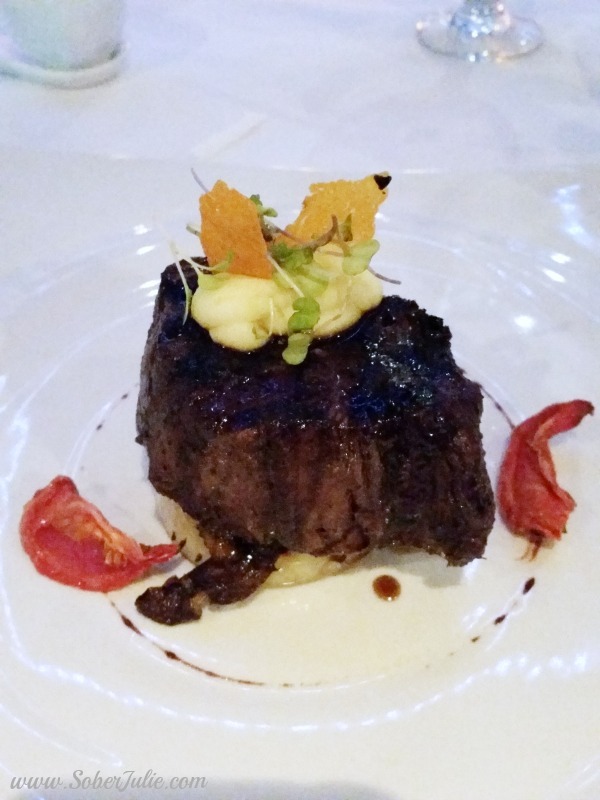 One experience you MUST book as soon as you step onto the Liberty is The Steakhouse Restaurant. This has an added cost of about $25 USD per person and is worth every penny! 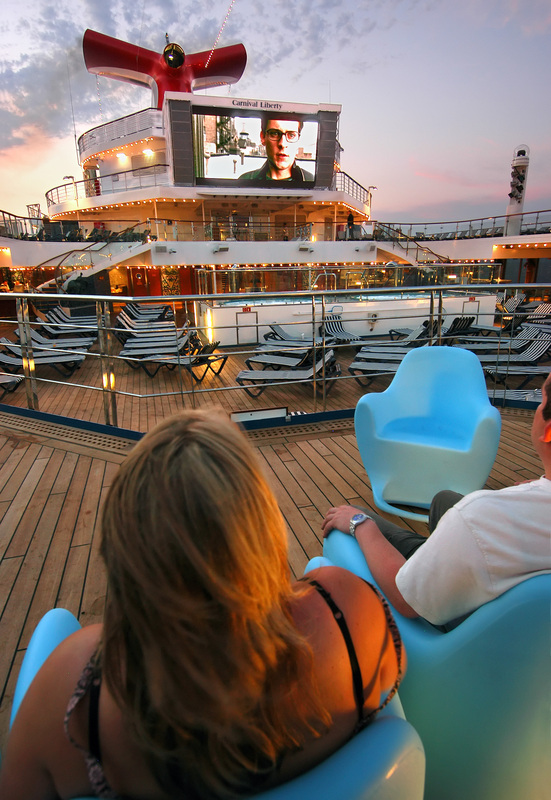 Grab a blanket from your cabin, get into your jammies and enjoy a movie on the Lido Deck under the stars! Every evening after dark Carnival rolls out a fresh movie each night in genres such as comedy, action, and romance. 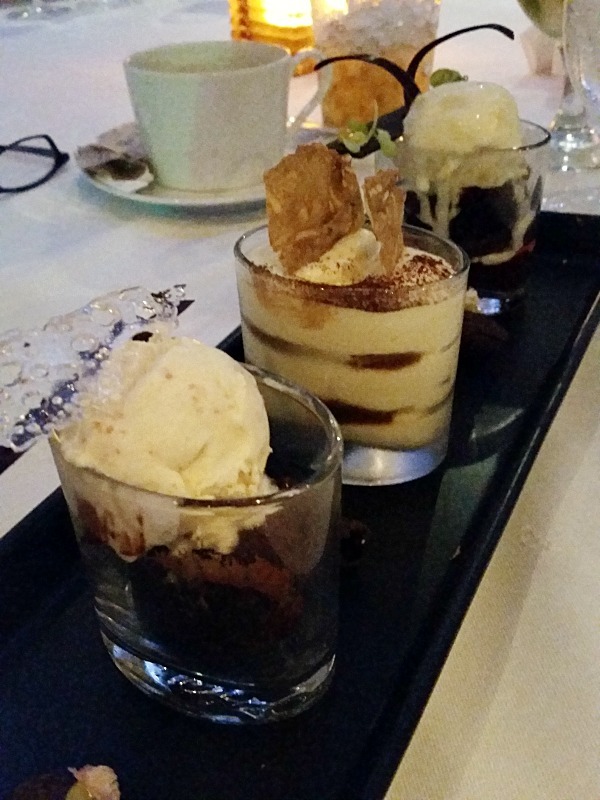 This was a favourite way for our family to unwind after a busy day! One thing we always enjoy while on holidays is a game of mini-golf but we’ve never quite had the experience like we did on the Liberty. 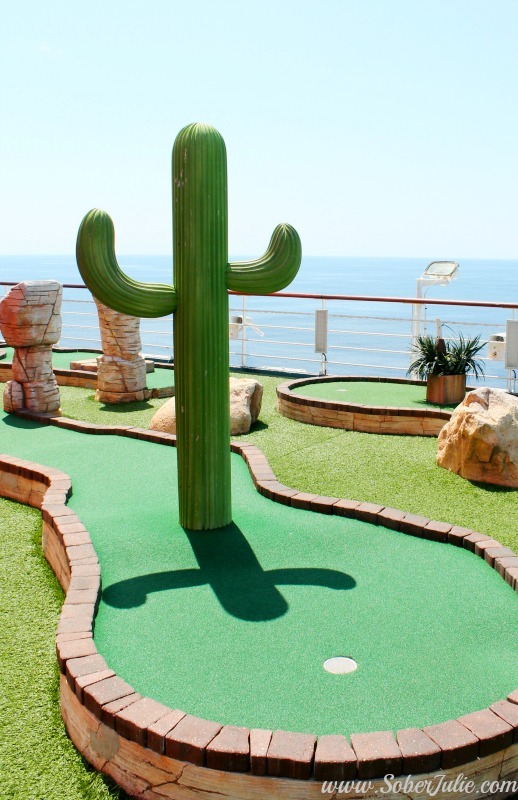 With the ocean in sight, and the breeze upon our skin somehow this game of mini-golf put the others to shame. 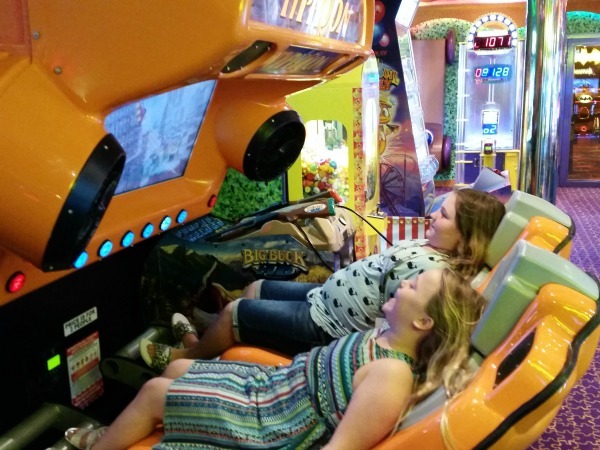 No matter where we are, if there’s an arcade anywhere nearby our girls will find it and BEG to go play. The Liberty has an arcade with a huge array of games, and is open to players of all ages, all night and all day. We budgeted a small amount for the girls to buy tokens each day before dinner and we ALL had fun! No matter what cruise you’re on…you simply must take time to watch the sights from the deck as you pull into or away from shore. The views are breathtaking and certainly build the excitement for the exploring you’ll be doing during the day. Make extra time in the morning, grab a cup of coffee and find your place on the deck rail. We had a wonderful time on the Liberty during our 7 day cruise, this is just a sampling of all there is to do aboard. It would be impossible to cover it all, as this ship has something for everyone! Disclosure: My family was invited to come aboard the Carnival Liberty in order to facilitate this article. All opinions are my own. Wow, who knew there was so much to do! Looks like an amazing time with something for everyone. I’ve never been on a cruise. I’ve been looking into going on one next year though. WOW what an amazing SHIP! 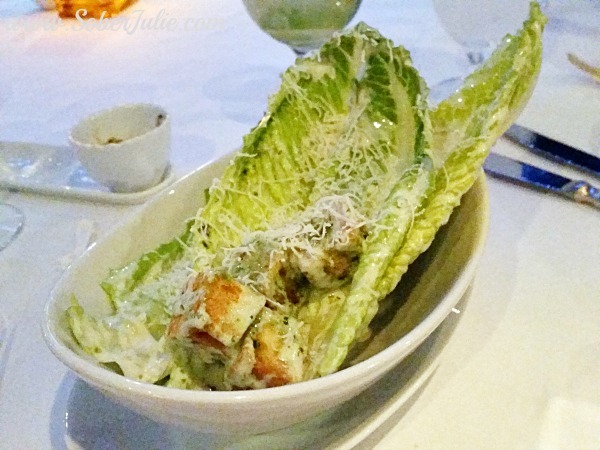 The food and the fun just look so amazing! I’ve never been on a cruise, but I think its time to book one…. 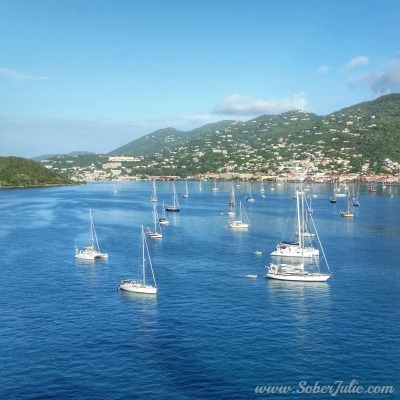 I have been on a Carnival cruise before and loved it! Planning one next year already!